We’re currently searching for motivated dealers across the country who share our passion for providing one-of-a-kind, cost-saving alternatives to traditional replacement windows. Thermolite secondary window retrofits install on the interior of a building’s existing windows with a simple frame system. This not only minimizes installation time and costs, but transforms a building’s original windows into a high-performing window upgrade that significantly reduces energy use and utility costs. Upgrading a building’s window system is one of the most effective ways to improve energy efficiency. Unfortunately, removing and replacing all of the windows in a building is costly – especially for high-rise buildings and facilities located in densely populated areas. Thermolite’s innovative retrofit system provides a simple and effective solution for reducing energy consumption in these types of buildings at a fraction of the cost of traditional replacement windows. Unlike traditional replacement windows, which require a lengthy and costly installation process, Thermolite windows install quickly and easily on the interior of a building’s existing windows. The original glass stays in place, eliminating the timely and costly need to remove and replace any glass. Also, no scaffolding or intensive labor is required, making the Thermolite system one of the easiest and most affordable commercial window upgrade available. Blast Mitigation | Thermolite’s Blast Safety Series is the only system made in the U.S. that uses dynamic loading and patented Compression Release Technology™ to withstand a high pressure impact without the need for structural steel reinforcement. Hurricane Protection | Thermolite’s Hurricane Storm Series system can withstand Category 5 hurricane winds and easily installs on the inside of a building’s existing windows and meets the strictest building codes in the country. Forced Entry Protection | Thermolite’s forced­-entry windows slow or prevent attempted break-ins, and are ideal for showrooms and display windows as well as the ground floor exterior windows of government offices and financial institutions. Historic Preservation | Thermolite’s RetroWAL system meets all federal historic preservation guidelines by preserving a building’s distinctive features, finishes, construction techniques and craftsmanship. Signal Defense | Thermolite’s CyberWAL is a window defense system that uses transparent metal-based coatings to protect against virtually all forms of electronic spying. 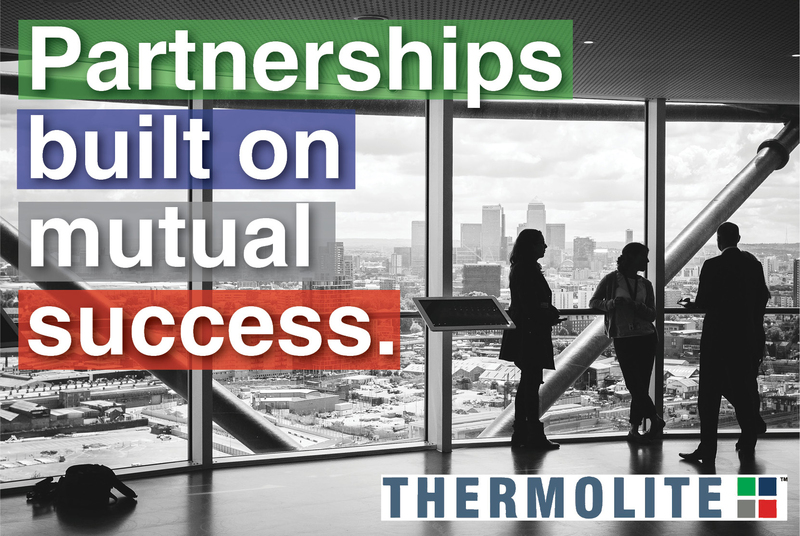 Thermolite window systems are optimal solutions for many types of commercial buildings, giving you a virtually endless opportunity to attract and serve new clients. Thank you for your interest in becoming a Thermolite dealer. You’re only a few steps away from being able to offer your clients a low-cost, high-performing alternative to traditional replacement windows. We look forward to hearing from you!